my kids and i have been sick for the past week. finally, springtime has sprung – the snow is gone, the sun is out – and we’ve all been stuck indoors with kleenex in tow instead of enjoying the beautiful weather. though, i would have to say that the one up side of having a cold is that you get to eat chicken noodle soup. you just have to. and the best kind of chicken noodle soup to have is the kind your mom made for you. my mom made this for me a couple years ago after getting the recipe from my sister, who got it from i-don’t-know-who. but i’m a mom, and my mom and sister are both moms, so i figure it’s just something that all moms should know how to make. it really does help you feel better – and that’s what moms do too. 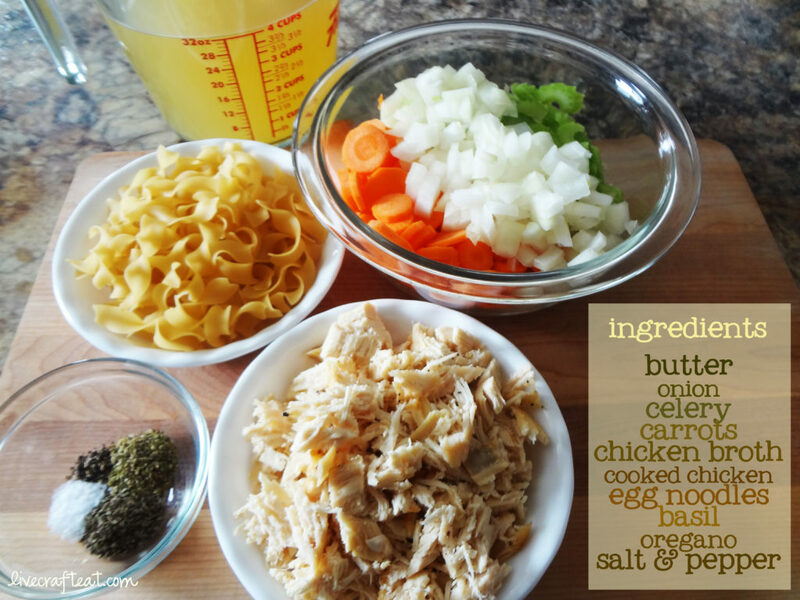 so, to make this easy & delicious chicken noodle soup is really quite simple. 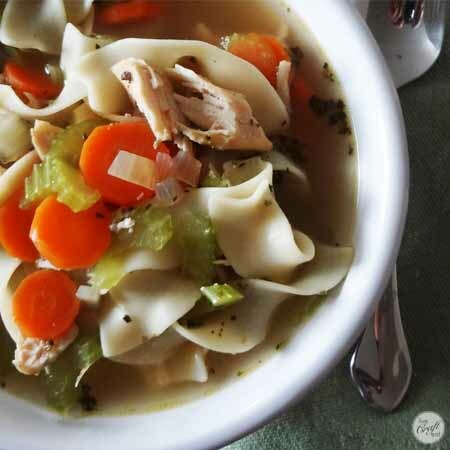 just gather the following ingredients: butter, onion, celery, carrot, chicken broth, cooked chicken (you could bake it, use rotisserie, or even leftover chicken would work), egg noodles, basil, oregano, and of course salt & pepper. now, all you need to do is sautee the onions, celery, and carrots in the butter. add in everything else. bring to a boil; reduce heat & simmer until noodles are cooked, about 10 minutes. super easy, but it’s a classic. i love this chicken noodle soup. Sautee onion, celery, and carrots in butter until soft. Add in the remaining ingredients. Bring all to a boil; reduce heat & simmer until noodles are cooked, approx 10 minutes. Enjoy! This recipe has come at THE perfect time. Just when we thought we were past sick season, my whole family gets hit with a nasty bug. We definitely needed some chicken noodle soup to help us get better. 🙂 We tried the recipe out last night and it was delicious!! Thanks, Kirstylee! Same deal with us – thought we were done being sick with the warmer weather approaching, but not so! Hope you’re all feeling better soon! Looks so good on a snowy cold day like today. Love the printable recipe card! I love how simple it is to make and that most of the ingredients I already have on hand. Yum! Awesome, Krista!! I’m glad you liked it! 🙂 What a great idea to put it all in the crock pot. 14 oz does not equal 6 cups of broth.what is the right amount? Hi Julie, thanks for catching that! It’s 6 cups (48 oz). Just what i was looking for,, easy and delicious!!!!! 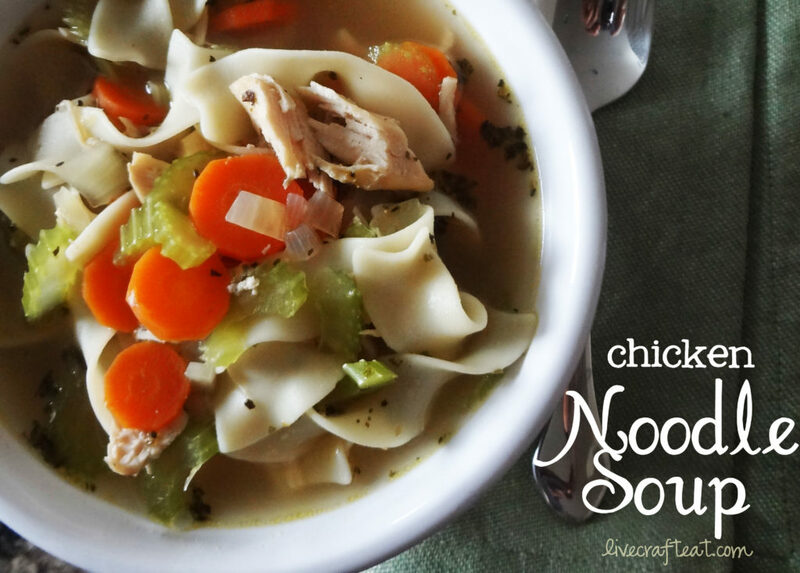 I made this tonight, after my wife had asked for chicken noodle soup, and since I’m watching my sodium intake, I didn’t want to use canned soup, but I wanted an easy recipe. I made it exactly according to the recipe, and both of us enjoyed it very much. This is now in my keeper pile of recipes printed from the internet. Thanks for a great bowl of soup! Great! So glad you and your wife liked the soup 🙂 It’s one of our favorites, too.